Last year, 11 bit studios wowed the gaming community with its dark and emotionally provocative game, This War of Mine ($14.99). An action-adventurer with a heavy dose of strategy, there was a lot to love and think about as players tried (sometimes in vain) to simply survive the horrors of war. Android and iOS players finally were able to check it out last month, and we’ve been running it through its paces to see if it made the transition to the mobile platform successfully. As you might expect, it passes with flying colors, and is truly a game that deserves to be played by everyone on iOS. 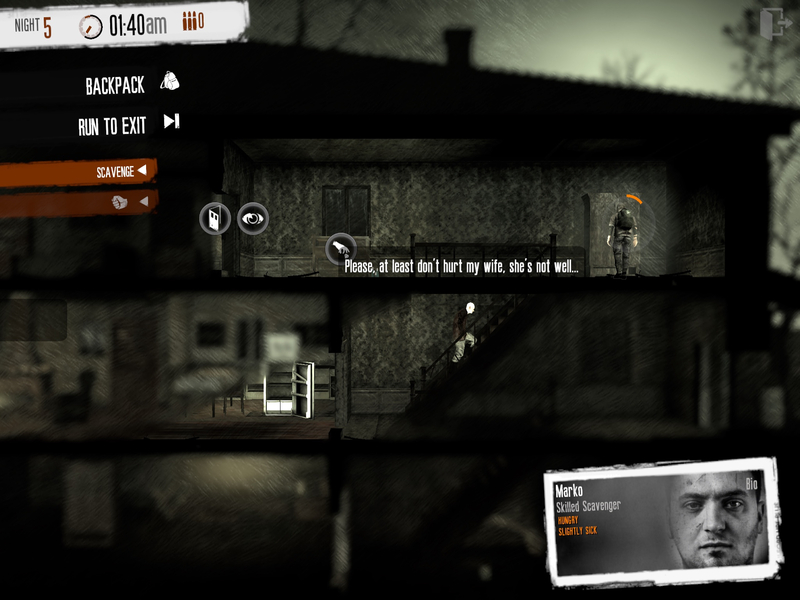 A simple premise (survive) in a complicated setting (a war-torn land still in the middle of fighting), This War of Mine explores the oft unmentioned aspects of war: what are the civilians without military training, without protection, doing to survive in a land that is ravaged by both friend and foe. There are no magic bullets to succeed. In fact, even the regular bullets are relatively scarce. Instead the focus is on the necessities: food, water, medicine, a place to sleep. Eventually you graduate on to the more complex necessities of life such as tools, defense, and items that attempt to provide some normalcy in this radical setting. 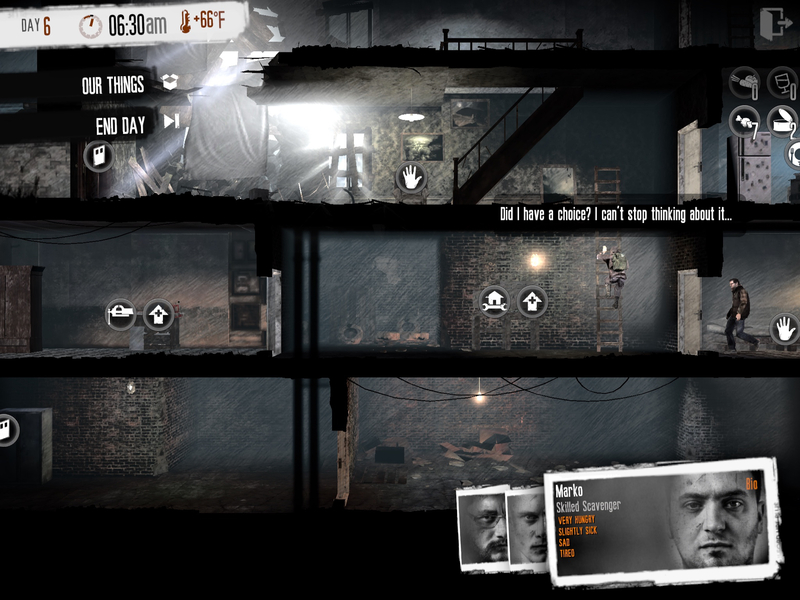 This War of Mine is broadly divided into two separate phases: the Day Phase and the Night Phase. During the day, you direct your survivors to clear and upgrade your multi-storied residence. Upgrades can be as simple as fixing up holes in the walls to increase defense, building furniture, such as beds, to increase the comfort level of your folks, to creating separate workshops that can unlock even more things to craft. Crafting is all based on basic items that are necessary for survival such as enforced doors, medicine and fuel to equipment such as shovels to clear out debris faster to item generators such as a rainwater collector. Crafting deserves some added discussion because I found the crafting system a bit daunting during my first run. However, once you get a few under your belt, it becomes easier to navigate and understand. This is important because survival is completely dependent on crafting the right items for the right situations. This is probably less important during your first run as a guide can mostly predict what needs to be done but on subsequent runs situations may change and force players to make tough choices. 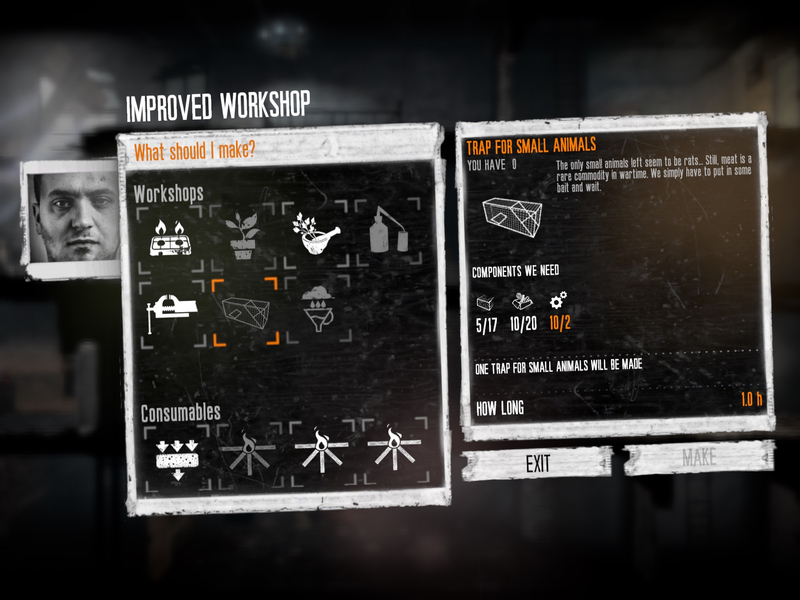 The companion to crafting is exploring and scavenging, which comprises the Night Phase of This War of Mine and is where the game really shines. At night players may send one survivor out into the world to scavenge. Various locations open up the longer the game is played, each with their own strengths and weaknesses in terms of items, as well as danger level in regards to NPCs. Some NPCs may be willing to trade and offer better items, others may want to kill you on sight. Meanwhile, some locations may be abandoned but require equipment in order to effectively clear debris, unlock ares and really clear out the loot. Adding to the strategy is the fact that survivors only have a limited amount of pack space, so you’ll really need to decide what’s important. Do you load up on the material and electronics to build? Or focus on medicine and food? Should you take a shovel to clear or a gun for defense at the expense of losing a storage slot for the actual scavenging? These are real questions that bear contemplation depending on the situation. Scavenging and Night Phase also present the most difficult decisions in terms of how to interact with these NPCs. Serious questions are raised as trading versus raiding (especially if you have the weapons and skills to take people down). The min/maxer might not have a problem with mowing down an innocent survivor looking for some medicine and willing to trade with me, but I had a really difficult time with actions such as that. Quite a few survivors you encounter are just trying to get by, like mine. It’s almost as if going through the drudgery of the Day Phase, building up my supplies, and trying to stay alive taught me a greater appreciation for that fight in everyone I saw. This is particularly the case when you encounter those locations that have folks that have no quarrel with you, but possess items that would certainly help if only you killed them. I knew it would make my experience better, but I just couldn’t do it, no matter how many times an online guide pushed me to do so. I think it speaks to the power of the narrative and setting that’s been set that this is even a discussion in a video game. There is a way to “beat” This War of Mine, and that’s survive until the cease fire day, when the war ends. However, making it to the end of the game will be difficult, as players will have to endure by collecting supplies, weapons and material to build and upgrade your hideout. Survivors can become wounded, sick, tired — understandable ailments when all hell has broken loose. However, such conditions need to be watched careful, as they can dramatically impact the performance of any character. Survival is accomplished through a tuned tap-based control scheme that fits right at home on iOS. In fact, I’d argue that the game plays better on the iPad than on the PC with a mouse and keyboard. The iPad also does a great job showcasing the beautiful visual art style of the game. Its grainy atmospheric art style certainly imposes a post-apocalyptic feel that’s jarring in the best sense of the word. I love every aspect of this game, but I have to admit it’s hard for me to engage in lengthy play sessions with This War of Mine. Every decision that I make during every hour of a game-day feels like it has so much weight that it’s in some ways emotionally exhausting. The same goes for scavenging for all of the reasons I’ve listed above. I say this not with any negative intent towards this amazing tactical/survival title. Rather, it’s to speak to how it manages to encapsulate how well the game portrays the horrors of the setting and why it’s simply a game that everyone needs to play. In my view, a good game entertains, while a great game creates a lasting impression of being entertained. This War of Mine goes beyond that by also impacting how I feel about certain decisions within the game and causing self-reflection. It goes without saying that such emotions would not be possible without the game actually being good to start with. However, rarely do games become experiences like This War of Mine, which earns it nothing but the highest praise in my book.